Redline Smalltalk (which is running on JVM) was updated. Read more. Use Pharo and cognitive services from Microsoft to find out about the happiness of people on pictures. The article is in japanese - but the code example shows what to do. Calypso is another system browser for Pharo. Read about it here or check the code here. Cuis Smalltalk switched to 64 bit now. Nice! Scroll forward until presentation starts after initial 10 minutes. Kilon is working on bridging with CPP code (using shared memory approach). Still not finished - but he made some progress by remote driving Unreal engine. Read more. A nice example of the refactoring capabilities of Smalltalk (here Pharo). Refactor until you are satisfied with the code and make sure your tests run green. 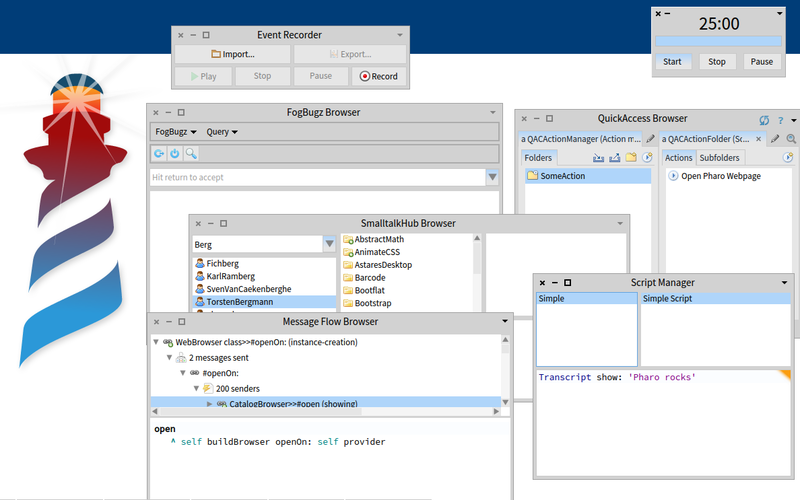 A new article from Sven concerning Pharo. Code is on SmalltalkHub. Read more on how to stream apps using Snowglobe. A Snowglobe demo is available here. Tether - Remote messaging between Smalltalks with WebSockets. Read more. It was twenty years ago that Dan Ingalls and the rest of Alan Kay's team announced Squeak to the world. SqPronterface - a Port of MacPronterface to Squeak (Smalltalk) to control a 3D Printers. Description is here. An API to communicate with drones. A new article on medium.com about Pharo. is online on the webpage. This time Sorabito with ALLSTOCKER - Asia's largest online marketplace for industrial machinery. Pharo is YOURS - so you can adopt it in any way. Even creating an own UI theme in Pharo is easy - as Luke Gorrie from Snabb demonstrates with his simple theme. 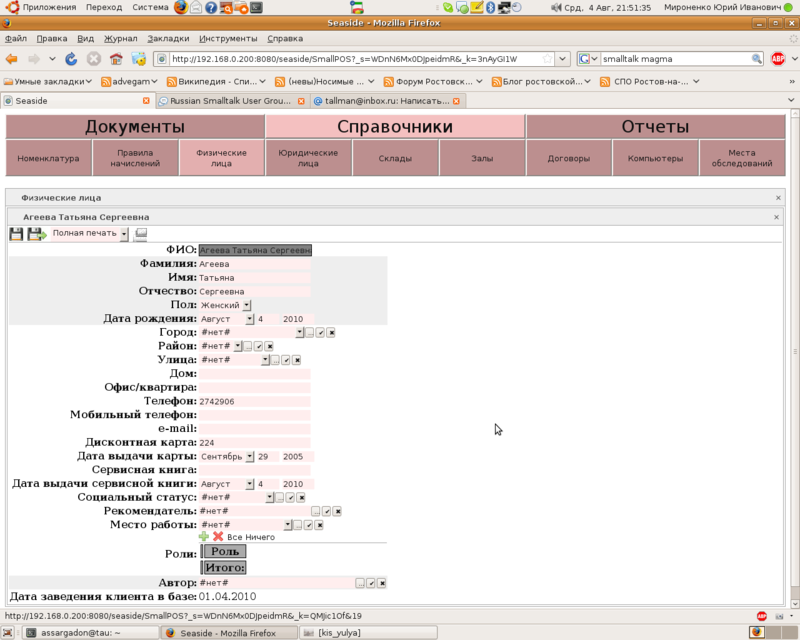 The project MaterialDesignLite to provide MDL for Seaside reached first milestone 1.0.0. A demo can be seen here. A new episode is online. Read the summary and the PDF. Robert C. Martin (from Object Mentor, Inc, also known as "Uncle Bob") once did a presentation in 2009 on RailsConf with the provocative topic "What Killed Smalltalk Could Kill Ruby, Too". The way this talk was presented was nice and funny - but by declaring Smalltalk dead he showed me that he never really followed this technology and all its offsprings close enough. For sure Smalltalk is not as widespread as Java, C++ or C# and it will never be on top of the TIOBE index (since this is the most stupid metric to rank programming languages ever invented). But it is in use, a productive and efficient environment to solve daily problems that would be hard to solve in other technologies. And all this in times where people (without having a deeper understanding) quickly decide for new technologies as the better ones "automagically" - because they think "newer means better". But often we see that new technologies just reinvent the wheel or provide an improvement only in a single aspect. Smalltalk is around now since 1972, lifted and commercialized in 1980, stable and mature, used in big and small projects and processes. Because of this age it is not the first time it was declared legacy or dead. But due its virtual machine and its dynamic nature it was and still is adopted to new platforms, new requirements or new hardware. Some Smalltalks can even run 1:1 in the webbrowser or on the Pi. So in the tradition of "The king is dead, long live the king!" Smalltalk is still alive and kicking. Primarily in the open source scene with Pharo, Squeak, Cuis, Amber there are many new success stories or books. "The Smalltalkers will, eventually, win. So says this old C++ programmer." But there is no competition, so there is no need to have a winner. Smalltalk is alive and still about new ideas - about new ways of computing and modeling our world to form something better. A book about Moldable tools (in Pharo) is available from Lulu. There are already multiple changes in the Pharo image to support the next generation VMs. Read more and give feedback to Clément if you see any issues coming up. Interesting approach to increase performance. Read more. There is already a planning going on for the next sprint meetings at INRIA in Lille (France). Made some progress on my pet project on the Raspberry Pi. Now using the new Pi model which is running much faster. Nice! Hope to find some time to update my medium article with the latest specs soon. Slides from this years ESUG meeting in Prague are now online. A new FreeType binding based on UFFI is available for Pharo. Read the announcement, a blog post with a description and the PDF docu. for Pharo was released. Read more. Binding between Pharo and R was updated to use UFFI. I hate it when to much time is required to setup things correctly to be able to code. Time is better invested in coding itself. We know there are quicker ways where one can just install/extract and go. An SDL2 based game in Pharo. Hardware gets cheaper each day. It also gets faster and faster to run dynamic object oriented systems like Smalltalks even on tiny single board computers. In this tweet Chris Thorgrimsson runs VisualWorks and Pharo side by side on Lattepanda, a cheap palm sized Windows 10 computer which costs around 100$. Nice! A story on LamResearch and Pharo work. Nice! The Smalltalk syntax fits on a shirt as you can see here. First slides of ESUG 2016 are available on Slideshare. Educational Bureau (using Phratch based on Pharo) is one of the candidates for the ESUG Technology Awards. Video is here. Cuis now runs on Spur! Additionally to Squeak and Pharo now also Cuis Smalltalk runs on the faster Spur version of the virtual machine. Nice! Have you written innovative Smalltalk? Then read more here. A video about Phratch used in eduction. Moose 6.0 based on Pharo 5 was released. Read more. there is a Camp Smalltalk at Marquette. Read more. 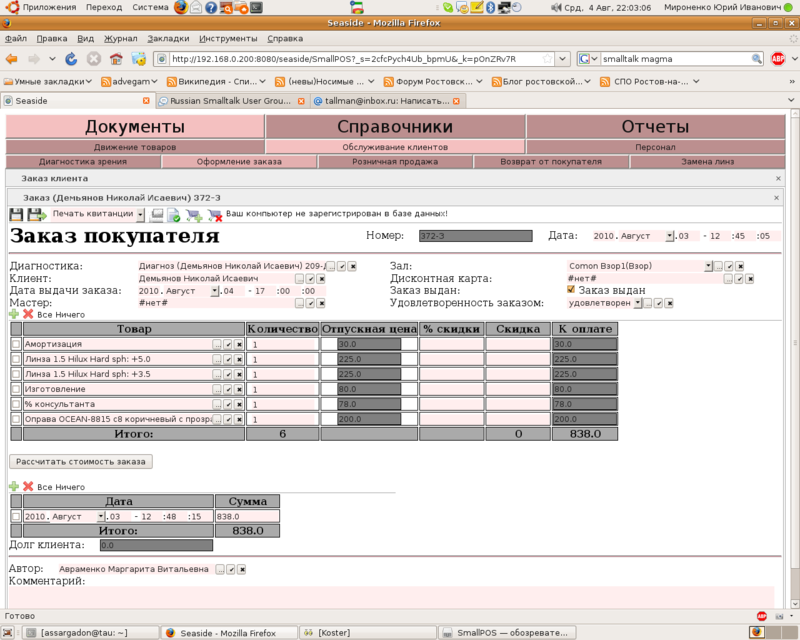 SmallPOS is a POS and accounting system for small business written using Seaside web application framework for Smalltalk. Pharo is used as platform and the Code is on SqueakSource. The license of SmallPOS is MIT. SmallPOS itself is a framework that can be used to build POS management applications. In 2014 there was a presentation about Modtalk - an MIT licensed modular compiled Smalltalk. Beside Voyage and MongoTalk now also the PunQLite project was moved to the "pharo-nosql" GitHub Repo as you can see in the worklog. This repo created by Esteban should host all NoSQL efforts in the Pharo community. Sista: closed alpha version ??! More work on Sista summarized by Clement. Does 1/7 + 6/7 = 1 ? Short reminder from Benoit St-Jean. Alan Borning's “ThingLab” (graphical constraint solver) running on the Smalltalk-78 VM by Bert Freudenberg and Dan Ingalls right in your webbrowser. Nice! Nicolas has finally compiled a 64bits VM for windows - and now the OpenSmalltalk VM has makefiles for 64 bits windows. Cool! With Smalltalks image approach you save the whole state of your "object oriented world" to disk and continue later at the same point of execution where you left. Some objects are part of the standard image since the 1970s which makes Smalltalk images software artefacts that are maintained since a long time. Nonetheless it also makes sense to bootstrap new images right from the start and (as I already reported) the Pharo community is working on that. Now there is yet another step done for this as you can read and now also try here. Note that the boostrapped image is already in Spur format. New update on Pillar for Pharo. Now also with an ePub exporter. Nice! A new update for Seamless is available. A tool to traverse object references for Pharo. Read more. JWT (JSONWebToken) is a token format suitable for authentication and authorization. Read about the Pharo implementation. Freewill is the name of the genetic algorithm framework for Pharo. Read more here or see it in action here. A draft chapter is available. Building an external Domain specific language (DSL) with the help of an internal DSL. Using PetitParser in Pharo is easy as this picture proves. From Blocks to BlockClosures now to FullBlockClosures. It is nice that Clément Béra summarizes current activities for Sista on his blog. A video demonstration of a 3D approach (in Pharo) from the paper with the same title. A demonstration video of the VISSOFT paper by Teseo Schneider, Yuriy Tymchuk, Ronie Salgado and Alexandre Bergel. Done in Pharo. How does a PR2 move through a door opening? By using LRP of course! Live Robot Programming (LRP) is a live programming language designed for the creation of the behavior layer of robots. It is implemented in Pharo. was updated to Pharo 5. Cool!!! The nice work of Ronie Salgado with Pharo and 3 summarized on his page. Nice! 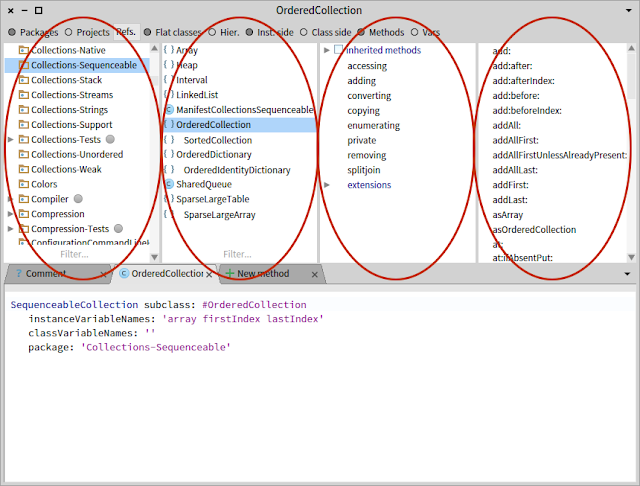 For relational databases there is the tiny SQLite database solution that just requires a simple linked library (DLL/SO file) including the full database engine. There is a similar tiny database called Unqlite in the NoSQL world. Pharo already had a Unqlite binding in the past. Before Pharo 5 this "PUnqlite" project was based on Native Boost. It was provided by Masashi Umezawa and I extended the project with a spec based UI to provide a database browser for Unqlite. During the Pharo 5 development I discussed with Esteban many issues on #Slack about porting several of my projects to UFFI. We also discusssed about Unqlite and Esteban quickly ported the PUnqlite binding over from NB to UFFI. This was done on GitHub. Additionally I remigrated the changes back to the original repo of PUnqlite on STHub and made it loadable from Catalog in Pharo 5 again. So with Pharo 5 you again have a package "PUnqlite" that you can load from Catalog. Just open Spotter and type in the name. During these #Slack sessions we also discussed about Estebans Voyage framework. Voyage is a layer that allows for very simple persistence in Pharo. It is explained here and here. So far Voyage only worked with MongoDB as backend. Often Mongo requires some setup which might be overkill for simple deployable applications that you want to build with Pharo. So we also discussed about using UnQlite as a backend for Voyage. Esteban wanted to work on this for a project and now first results are available: Voyage is now restructured with a second backend to support also UnQlite beside MongoDB. support is on its way. But I guess if you have need more than 15 arguments in a method you should think about your design. Possibly an argument object would be applicable. Interesting, there is an implementation of a Slack client on SmalltalkHub. A simple replacement for Pharo's native file/folder selection dialog. Code is here. Client side interface to the Linux Music Player Daemon written in Pharo. Project is here. Like this ycombinator thread: "When they say that in Smalltalk, everything's an object, they're seriously not kidding. Everything is an object, including compiled code, stack frames, execution contexts, threads, etc. " A simple objects analysis tool. Read more. No! No! No! Dont extend Smalltalk with things like that. Just because you can extend Smalltalk does not mean you should do on all ends. So unlearn your traditional syntax thinking before starting with it. Code should tell a story to be maintenable and not end up in deciphering cryptic syntax sugar. Lets think in objects and stay readable with: #ifTrue;ifFalse: please! 64Bit virtual machine for Pharo, Squeak, ... are in the pipe - VM developers move forward on this frontier. There is now also 64bits image generation for Pharo. While in the last century it was hard to run dynamic systems like Smalltalk times have changed a lot. But now Hardware and software become faster and even smaller each day. This leads to suprising results. A theme for Pharo to look like Ubuntu. Looks nice. Code is here. A Pharo project on ... readability. for Pharo is available here. A new article from Clément Béra about "Simulating the Cog VM"
Epicea is now integrated into Pharo 6. A new article from Richard Eng on who uses Smalltalk. There are many people and projects all over the world who use Smalltalk. And yes it is true that mostly new projects start in more "fashioned" languages like Java. So this is more a question about how well known Smalltalk is and about popularity. There is also this common misbelief that new technologies must be better out of the box. I have some doubts in that - because today many software technologies or languages are very specific, written in a hurry or lack a solid and stable engineering foundation. My answer to the question on who uses Smalltalk would be much easier: anyone who is interested in clean OO solutions and knowledgable enough to value increased productivity and long term maintainability. There is a low traffic “Pharo Newsletter” Mailinglist. If you want to join read here. for Pharo in Pharo. Read more. A small tool to show local FileTree repositories in GTSpotter, as a way to add them into repositories list. Read more. Want to step into the details of the Panama leak using Pharo? Then continue reading here. Pharo 64 bits image on 64 bits VM running on Mac & Linux. Yay!!! Read more. Free Software for Mobile Communication in Pharo. Read more. The virtual machine used for open source Smalltalks like Squeak and Pharo is now moved from Subversion to GitHub. TokyoDB is a Pharo wrapper for Tokyo Cabinet. Want to learn about virtual machine programming? Then have a look here. I assembled some of my free goodies for Pharo into a Pharo distribution called "AstaresDistribution". If you use PharoLauncher you can easily load it. The image is available on the Pharo Contribution CI server. Pharo 5.0 is still in preparation - but you can already try before the final release step. Parasol is a Pharo Smalltalk framework to automate web browsers. It's particularly useful to write automated tests for Seaside web applications. Its design and implementation are based on the Java Selenium WebDriver API. for Pharo. Check out the code here. The online course in Pharo starts today. "Every time I look at Smalltalk, I feel I know how Dark Age engineers must have felt looking at the Roman Aqueducts." Did you notice that the commits from Eliot Miranda to the Squeak/Pharo/Cuis/Newspeak VMMaker packages follow a year pattern (1850, 1851, ...) and include not only a description of the changes but also what happened in the year corresponding to the commit number. A genetic algorithm implementation is available from the Pharo Catalog provided by Alexandre Bergel. I helped Alexandre in providing the config for this. I like the package. His genetic algorithm code is nice and interesting - it allows to play with Genetic algorithms in the regular Smalltalk tools (workspace, inspectors, ...) and the package also provides Roassal visualizations for them. You definitely should check this package out. Code is on STHub. Weka is a collection of machine learning algorithms for data mining tasks. Weka defines a format called "Arff" to be used for data importation. On GitHub you will now find an Arff generator written in Pharo. Want to style your Pharo image with a wallpaper image? Peter describes the possible options in detail. as described by Pierce on his blog. Really nice! Tim optimized Scratch for the Raspberry Pi ... now it runs much faster. Read more. The GemStone/S GCI code was ported to UFFI and now allows to have a minimal tODE API for accessing the object database from Pharo 5.0. Read more. New version of Mocketry 3.0 for Pharo is available. Read more. Back from the days when I used Squeak there was a nice tool called "Algernon" which was a simple "type in search" tool. I used it very often. Later in Pharo days such a tool was missing - but after a while the "Spotter" tool for Pharo was provided by the GT team based on the same idea. The nice thing is that now also the Algernon code was updated for latest Squeak in a project called "Algernon-Launcher". BTW: Spotter does not allow to evaluate the given text as expressions, but the tool is extendable and maybe should provide this Algernon feature by default as well. Want to learn about virtual machine construction. Then check out this one. Repo with code is here. Read more here. Short video on how to report a bug in Pharo and fix it. is available. Read more here. "OOP is dead long live REAL OOP (with Smalltalk and Pharo)"
called Smallapack. Check out out here. CDB, which is short for "constant database" is a database where the DB contains an entire data set (e.g. a single associative array) in a single computer file. Four students from a lecture released the Pharo implementation for CDB support as Stef wrote. The repo can be found on STHub. You can download the tool in latest Pharo 5 (50660 or later) from catalog or by opening the Spotter and entering "FogBugz", wait and hitting ENTER. After a renaming discussion on the pharo-dev list I suggested to rename "SciSmalltalk" into "PolyMath" and it looks like this proposal got accepted. A project to extract model data from a SAP system into the analysis platform Moose on Pharo Smalltalk (by using FAMIX). Read more. You can setup a full Seaside application behind Apache webserver. Or you could setup more lightweight behind NGINX. Here is a short help on how to do that on Linux. The smallest piece of great Pharo code described in another article from Sven. New with support for bitmapped images. Any Smalltalk image can be added to a PDF and many images can be extracted from existing PDFs. Using Pharo - see this video. Web applications everywhere, but there are still desktop applications with full access to the underlying computer on the other side. But meanwhile one can also create desktop applications using HTML, JS and Node.js, package them into an executable file and distribute it to all platforms (Windows, OS X, Linux, ...). There is a framework called Electron that allows to package an HTML/JS based application as a desktop application. Havent checked how fast this is ... but the lines between desktop and web based Smalltalk deployment become blurred once again. There is free access to Ephemeric Cloud to all Pharo association members. Try it out! Plimbole is a sequencer for Generative Music that you can treat it either as a standalone program or you can get the Dolphin Smalltalk source and hack away to add new features of your own. I like articles like that from Clément Béra, it shows the power that we have within Smalltalk systems. Sven and Henrik cared about better Unicode support for Pharo. Read the announcement and have a look at a new article describing the details. You can read about some new features of GT in Pharo 5 here. The new Squeak Oversight Board for 2016 is elected. Release 0.15.1 is out. Breaks IE8 compatibility, wraps Promise directly, has a few changes under hood & will be strictly semver from now on. Another demo of Bloc (the replacement for Morphic): a hit test. BioSmalltalk: Bioinformatics in a pure objects environment. Based ob Pharo. If you like to apply read here. And you learn that everything is an object in Smalltalk but not in Ruby. A Bountysource Team for Pharo was setup by Marcus. This means that everyone can suggest bounties or contribute money to existing bounties. This project provides bindings to the GitHub API for Pharo. Nice !!! Hidden Gems Screencast by Arden Thomas demoing useful Smalltalk use. Currently in Pharo the image is maintained step by step by adjusting and changing it. 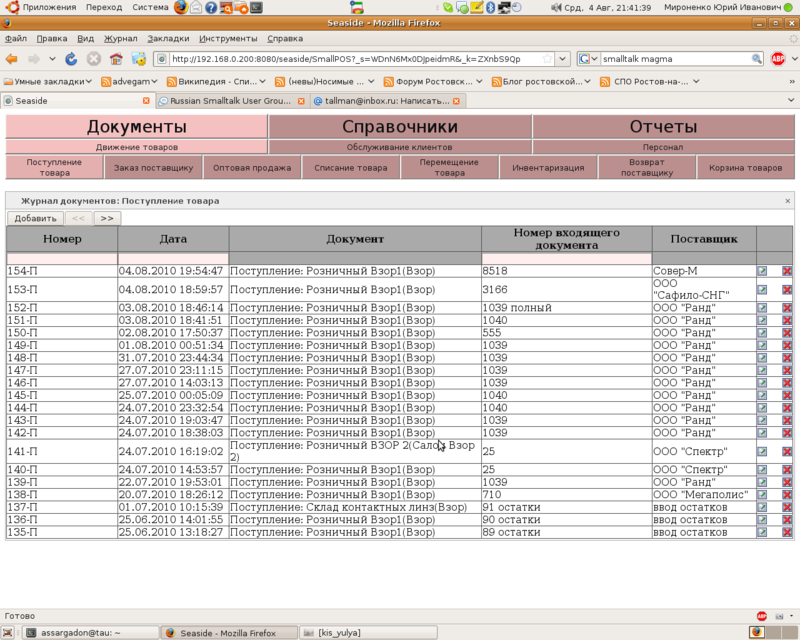 It is like a database of objects that you maintain over time. But since the beginning of Pharo there was this also the dream to be able to bootstrap the image cleanly right from the ground up. It is a lot of work to prepare such a bootstrapping process - but now the efforts bring the first fruits: there is a minimal Pharo kernel that is bootstrapped. I can only say: amazing work! Spotting senders and references using Spotter in Pharo is explained here. You can also use the MessageFlowBrowser. So far there was an OSProcess project for executing OS commands from Pharo. Mariano is working on a new project called "OSSubprocess" that works with the new unified FFI. He reached a first milestone now - you can read about the details here. The Pharo Consortium is the sponsor of this development. Snowglobe is a SqueakJS remote display surface written by Craig Latta for Squeak Smalltalk. So Squeak is running in a browser (Chrome here), acting as the display for a native Squeak app running somewhere else on the internet. Up to image build #50496 (where 50000 range means Pharo 5.0) the Pharo images were non-spur. In December the image was migrated to Spur to get more speed and profit from the new virtual machine architecture. So for any newer Pharo 5.0 image you need the new Pharo Spur VM. PharoLauncher is now able to find out if an image reguires the new Spur VM or the old one. You can set the location of old non-spur VM and new spur VM in the PharoLauncher settings. This way you can work with old images Pharo 3, Pharo 4, Pharo 5 up to build 50496 as well as with the newer ones. Read this post for more details or grab PharoLauncher from CI server. There is a project from Esteban called WorkLog. It is written in Seaside. If you would like to see it in action just visit: http://log.smallworks.eu/web/post/ and receive some infos how busy he is preparing Pharo for the future. Want to run Spur virtual machine for Pharo on Debian. Then check out this one. There is a CI build available. A Turing Machine simulator written in Pharo by Julien Delplanque. A PhD Dissertation from 2006 about Dynabook and Smalltalk. Interesting nonetheless.